We develop your organization’s agility so that you can achieve your purpose. We use the Kanban Maturity Model (KMM) in combination with practices from other methods and models like CMMI, PMBoK, Lean, and Agile to help you reduce delivery time, improve your flexibility and adaptability to the needs of your customers, as well as increase the efficiency of your workflow. Provide the necessary coaching to help you create the solutions that bring you to your goal. 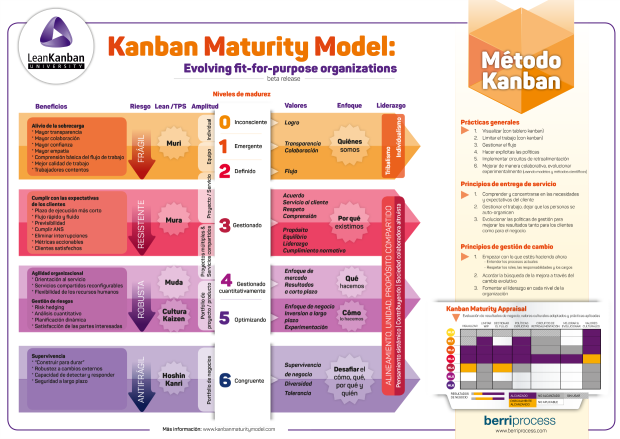 You can download Kanban Maturity Model description poster from here. If you have any doubts, call us and we will resolve them.